Directed by Floria Sigismondi and choreographed by the Golden Boyz, Pink’s just-released video for Try is a visual feast, spilling over the brim with passion, paint, and vicious acrobatics. Dancer Colt Prattes (Ummm, what a f*cking hottie! Sorry, had a moment!) takes on the leading male role in the video, creating a physically emotional and relatable presence with Pink in a series of modern dance scenes. Try is the second single released from her latest album, The Truth About Love, and on a personal level, one of my favorites from the album. No joke, I’ve played this damn song probably 500x since the disc was released. This may be a bold statement, but I think this is Pink’s greatest piece of work, from a visual slash music video perspective. Stunning music video + recent live performance following. PALOMA FAITH CONCERT TIC GIVEAWAY! The above pic is interactive, so scroll your mouses (mice?) over it, people! Pretty dope, right? 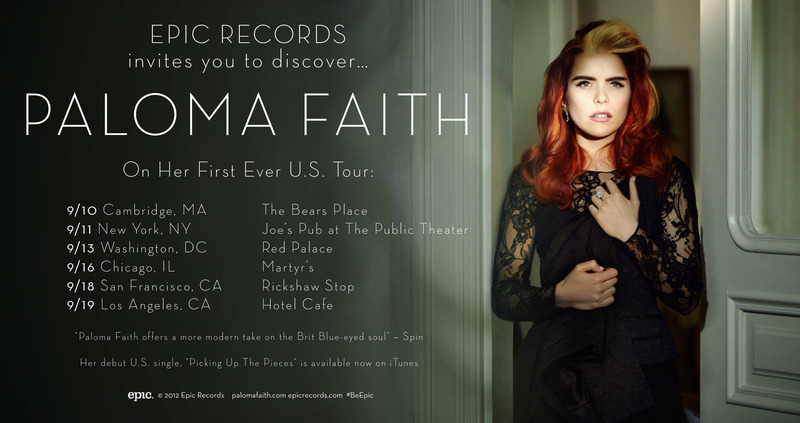 Paloma Faith is coming to the Big Apple and we’re feelin’ like Oprah. Yup! We’re doing a giveaway! Paloma, who’s in the vibe of Lana Del Rey meets Florence and the Machine, is playing at Joe’s Pub on September 11th. To celebrate the intense awesomeness that is this pixie pop package, BiggerThanBeyonce is giving away a set of tickets to the upcoming show. To enter, LIKE us on Facebook or FOLLOW us on Twitter, and let a hoe know! May the odds ever be in your flavah. Paloma Faith EPK from Epic on Vimeo.